The National Policy Forum (NPF) consultation process, to shape the Party’s policy agenda is now underway and the deadline for submitting consultations is 24 June. The 2016 Memorial Lecture was held in remembrance of John Fitzmaurice and Mike Ridgeway. Mike passed away earlier this year and had participated in Brussels Labour for many years, including as auditor of our accounts. We warmly welcomed Françoise, Mike’s partner, to the meeting. His fellow auditor, Peter Wragg, told us how Mike was well known in Brussels circles and was also an active member of the Belgian Parti Socialiste. He was quite a private person with a dry sense of humour but who was fiercely loyal to Labour and, today, would have called strongly for party unity. Peter had known well Mike and John and he was moved to remember how they had both been discreet but selfless and learned comrades. Also on this occasion, Labour International was pleased to give Frazer Clarke an award in recognition of his services as Treasurer. Emma Reynolds, MP for Wolverhampton North East led a Delegation of MPs and gave the keynote speech. Emma had been Shadow Minister for Europe, as well as a former Treasurer of Brussels Labour ! She was delighted to see many old friends and had come to Brussels to discuss the situation in her new role as a representative on the Brexit Committee in the House of Commons. She recalled the first ever John Fitzmaurice lecture given by Neil Kinnock. In those days Socialists were in power in 11 countries across Europe and there was a sense of a world full of possibilities. Never would we have imagined what was happening today. However, Emma went on to say that today we needed to accept the situation. Working people did feel that they were neglected and were worried about their livelihoods. The Theresa May government seemed to put migration above all other issues, to the extent that it seemed to put UKIP into power without being in office. A hard Brexit was possible but it posed huge questions. The recent High Court ruling clarified that since Parliament voted for the European Communities Act when the UK joined the EU, then only Parliament could repeal it. Labour MPs are pressing for a transitional free trade arrangement to fill the gap between the end of the Article 50 exit procedure and the conclusion of a full free trade agreement in compliance with Article 218. Otherwise there was the risk of less favourable WTO rules coming into force. Emma outlined her principles for an exit settlement. We should defend progressive rights and avoid race to bottom. We should also ensure the closest possible relations with the EU and reform free movement. There was a spectrum between all or no free movement and a debate was needed to convince voters that we had a fair system. UK financial expertise and the role of the City of London were valuable to Europe as well as to the UK it was in our mutual interest to preserve this. Furthermore, it was in all our interests to have a new relationship with Europe including British participation to deal with strategic issues such as security. In the discussion that followed several friends questioned whether Labour should support Brexit following a referendum based on misinformation and which risked leaving the UK worse off. Emma underlined that in her view it was necessary to respect the result of the referendum, where 17 million people had voted to leave the EU. It was fundamentally important to respect democracy. Theresa May was apparently intent on leaving the single market and therefore Labour had to focus on setting its own objectives for the Brexit process. We needed to say that European cooperation was still valuable and have the softest Brexit possible. Stephen Kinnock, MP for Aberavon, spoke about how Brexit and the Trump victory pointed to a new post-liberal age where popular opinion had shifted. Labour had a choice between continuing to fight for existing policies, and risk perpetual defeat, or engaging with this new mood. 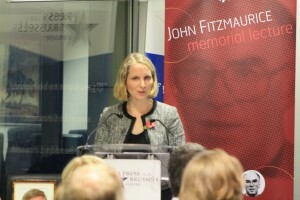 Other comments included that the softest Brexit will leave Britain worse off than what we have now with no Schengen and the budgetary rebate; the need to be pragmatic if the Brexit negotiations revealed that the Leave promises were unattainable and public opinion changed; the need to ensure reciprocal rights for EU and UK workers and respect acquired rights. Click here to read Emma’s speech in full. This year’s conference was characterised by two major themes which recurred throughout the week. The first was Europe and handling the result of the referendum. The second was the division between the party leader and the PLP. On the first, most speakers argued that the party should accept the result of the referendum; not primarily on the democratic argument but mainly to avoid antagonising or patronising the many people who voted to leave. However the consensus was that the party was not bound to accept the outcome negotiated by the government. The aim would be to defend workers’ rights and to ensure that the cost of exit does not fall on those least able to deal with it. For most speakers understanding the leaver’s motivation means accepting limits on migration. The exception was the party leader who stuck with the old position of dealing with the stresses migration puts on services and the abuses in employment. On the second question there was a real desire for unity in most of the public debates. A few platform speakers made coded criticism of Corbynism by focusing on the need for Labour to win power; only by being in power can Labour deliver for its people. On the other hand Mr Corbyn himself and many of his supporters also argued that Labour’s aim was to win power. One recurring controversial issue began with the first item on the first day of Conference. The Conference Arrangements Committee (CAC) presents the day’s agenda in the form of a report. The first day’s report was challenged due to the decision that constitutional amendments proposed by the NEC would be voted as a block rather than individually. Not for the first time a procedural issue on an internal question was the most heated at conference. Some delegates were unhappy at the proposal to add two members to the NEC one representing the Labour group in the Scottish parliament the other the Labour members of the Welsh Assembly. These posts would be nominated by the leaders of the respective groups. Their underlying concern was that this change would tip the balance in the NEC where recent elections have just given a narrow majority to supporters of Jeremy Corbyn. The report was adopted on a show of hands. However the issue returned the next day at the same point. Monday’s CAC report was adopted after it was pointed out that the report referred only to that day’s proceedings. On the Tuesday morning, the day when the amendments were due to be debated, things got heated. Reference back was moved again, this time with the demand for a card vote made at the outset. The chair refused to hear the demands for a card vote and called for a show of hands. Despite numerous delegates demanding a card vote and pointing out that the Chair had no discretion, the rule book requires a card vote once it has been moved. The Chair continued to ignore all calls for a card vote and challenges to his ruling and proceeded with the day’s business. National Policy Forum Report – Keith Birch moved the report of the NPF; reports of each Commission were moved later in the conference. The last part of the morning was given over to a presentation by Tom Watson of the Party’s continuing development of digital tools. He unveiled the new MyLabour app and a new app for canvassing. Sunday afternoon session was taken up with discussion of the NPF reports on Communities and Transport. The debate on the Communities report focussed largely on housing and major speakers Teresa Pearce (shadow housing minister), Nick Forbes (LGA Labour Group Leader) and Rachael Maskell (shadow DEFRA minister) all spoke of the need to increase house building particularly council housing. Sunday also saw reports from Wales and Northern Ireland. Carwen Jones, Welsh first minister, spoke of the success in the Welsh Assembly elections where seats lost in the2015 general election had been won in 2016. His theme was the benefits of Labour in power. Wales’s unemployment is 1% below the UK figure, he said with not just jobs but better jobs. He announced the Universal child health initiative which the Welsh government would launch the next day. On leaving the EU he emphasised the need to keep access to the single market and argued for listening to the message on the free movement of people. Dave Anderson, shadow Northern Ireland minister, reminded delegates of the role of the Labour Party in the peace process and praised the part played by Mo Mowlam. He spoke of the positive role played by trade unions during the troubles, without them he claimed the troubles would have become a civil war. Conference then held a tribute to the life of Jo Cox. At which a short film was shown and Rachel Reeves and Jan Royall spoke. The results of the ballot for contemporary motions were announced and the Brexit motions were not prioritised. The morning session included the International report including the report form the international commission of the NPF. Glenys Willmott (leader of the EPLP) spoke about the referendum campaign. She thanked and congratulated all those who had campaigned with the Party for remain. The task now, she said, was to hold the “leavers” to account for the promises they made and the lies they told. We should not try to reverse the result but we needed to stand against populism. Labour should be prepared to reject any deal which did not have the right protections for the environment, for employment and for public services. Nuclear disarmament, talks are not enough disarmament will be the test of our foreign policy. Kate Osamor (shadow international development secretary) attacked the Tories for trying to bring conservative values to international development. She committed Labour to retaining DfID and meeting the 0.7% of GDP target. She would give an emphasis to women’s economic empowerment. Labour would be tough on corruption and tough on the receipts of corruption, which meant action on British tax havens and international tax evasion. She paid tribute to the work of Alf Dubs and Yvette Cooper on child refugees. In his speech Clive Lewis (shadow defence secretary and energy secretary) paid tribute to the armed forces and deplored the cuts in numbers made by the government and the lack of funding which left forces personnel in substandard housing. He committed the Party to meeting the NATO target of 2% of GDP. On Trident he declared himself sceptical about its value but accepted the Party’s policy on replacement. He wanted to make “multilateralism” a reality. He saw the Tory policy on Trident as an ambush for Labour and one we should avoid. He called for a return of Labour’s defence industrial strategy and said he would campaign for the three support ships for the new carriers to be built in Britain. The rest of the day was given over to the economy including the NPF report. Barry Gardiner (shadow international trade secretary) said leaving the EU would change trade and the balance in trade negotiations. If we thought TTIP was a bad deal wait until the UK has to negotiate on its own. He wanted a progressive trade policy which works for SMEs. On energy, he pointed out that the Paris Agreement was built on Labours climate change law. He announced that a Labour government would ban fracking and would consult business and trade unions on the transition to a low carbon economy. Local government projects were showing the way forward on a bottom up energy policy and he committed to retrofitting insulation in homes of veterans for free. The big speech of the day was by John McDonnell (shadow chancellor).On leaving the EU he said the Party should accept the decision but not the tory outcome. He wanted access to the single market for goods and services but would not accept undercutting wages and public services. He would support access for financial services but with safeguards against a repeat of 2008 and Britain should retain a share in the European Investment Bank. Labour would protect the rights of EU nationals and of UK nationals in Europe. finally introduce a real living wage. Monday also feature the international speaker, Scott Courtney, VP of the Service Employees International Union. He told the story of American workers organising around the demand for $15 and a Union. This campaign which has successfully organised the first industrial actions by employees of fast food outlets has seen spectacular growth in support for its demand for a $15 minimum wage. A number of states and cities are taking steps towards this minimum. What began as an ambitious demand is gradually becoming mainstream. The Scotland report was given by Kezia Dugdale, Leader of the Scottish Labour Party. She began by thanking members for their efforts over two and a half years of elections. She defended Scottish Labour’s policy of adding 1p to income tax and introducing a 50% higher rate, berating the SNP government for accepting cuts to NHS services and the education budget imposed by the Westminster government. She accused them of demanding power then refusing to act. Labour would not support an austerity budget nor would they back a second referendum on independence. Diane Holland presented the financial report drawing attention to the £5 million surplus. The Party was now debt free thanks largely to the financial philosophy which was to 1) improve income, 2) control expenditure and 3) stick to priorities. This approach, she said, would continue. Asked about the impact of “£25 supporters” she explained that these account covered the previous period and so that would show in the accounts presented next year. Rule changes were presented and card votes held. The changes proposed by the NEC and a change to allow Party sections for retired trade union members were carried. Others were defeated with the exception of a change to voting on NPF reports. In future it will be possible to refer back parts of reports. This will have a profound effect on how conference works in future as it opens the possibility of more policy debates as issues can be fought out on the floor of conference. The health report of the NPF was moved. Diane Abbott (shadow health secretary) spoke of the Party’s support for junior doctors in their fight on new contracts. Labour was campaigning against the abolition of bursaries for trainee nurses and would restore them when in office. On leaving the EU she pointed out that 50,000 EU national work for the NHS and that 80,000 work in social care. Ending free movement of people would be a disaster for the NHS. She pledged that a future Labour government would halt privatisation and marketisation of the NHS, repeal the Health and Social Care Act and end PFI. Paul Flynn (shadow leader of the House of Commons) gave a rousing speech calling for unity. He invited MPs who had left to return to the front bench and pointed to the successes the party had had in elections and its achievements in the House of Commons. He attacked the proposed reduction in numbers of MPs saying the Lords had 200 too many peers. Leaving the EU meant this was not the time cut MPs. The party needed one leader, one opponent and One Direction. The fraternal speech for the TUC was given by Liz Snape. She too called for unity and used the example of resistance to the trade union bill. The Tory attack on trade unions and their link with labour had failed. Sadiq Khan addressed the conference as mayor of London. His speech was preceded by a short film. His theme was Labour in power and he gave examples of what Labour can achieve when in power locally and called for a focus on winning power where it matters most. The conference adopted two resolutions proposed by the NEC. The first represented the ten point plan set out by Jeremy Corbyn during his leadership election. These points will now be further developed in the NPF. The second concerned international trade deals and reflected the issues raised in campaigns against TTIP and similar deals. Tuesday also saw the education report from the NPF and emergency composite on grammar schools. Delegates were supplied with placards reading “Education not segregation” to wave during the discussion. Angela Rayner (shadow education secretary) made a scathing attack on the prime minister’s support for grammar schools. She pledged to make all academy and free schools accountable. She promised also that Labour would bring back education maintenance grants and student grants. The composite on energy policy was debated. The resolution calls on the government to ratify the Paris agreement on climate change and advocates a strategy including gas and nuclear power alongside renewables. In the debate trade union speakers supported the building of Hinckley C while CLPs tended to speak against and for a100% renewables target. Tom Watson (Deputy Leader) made his big speech at the end of the session. He set out a position against neo-liberalism saying we do not worship the market; the market is good for some things but a successful country needs government to intervene. He announced an independent commission to examine the future of work responding to the growth of self-employment and the “gig economy”. He called for a real living wage and real contracts not zero hours contracts. He went on to praise the achievements of the last Labour governments. Denigrating our past, he argued, would not help us to win in future. The result of the NCC election was announced with Maggie Cosin winning the seat. Wednesday morning was taken up with the report on home affairs by the NPF and the contemporary composite on child refugees. These gave space for two former leadership contenders to show conference what they had missed. Richard Burgon (shadow justice secretary) spoke about defending the rights of people at work and pledged the abolition of fees for employment tribunals. He referred to the deterioration of conditions in prisons where violence and drugs were increasing and promised better support for prisoners after release. Cat Smith (shadow women and equalities minister) gave most of her speech to young people arguing that cuts to services for young people now were creating problems for the future. She claimed that there had been a 20% jump in young people registered to vote, but that the new boundaries did not take account of this increase. Here were more Labour Party members under 27, she said, than the entire membership of UKIP. Ann Black reported from the Women’s Conference. She focussed on the new phenomenon of threats and intimidation on social media. She drew a comparison with the reclaim the night campaign and said the same approach was needed on social media. Yvette Cooper spoke on the motion on child refugees. She began by talking about Syria and praised the work of the white helmets and of Jo Cox. She criticized the government’s delays in acting on taking child refugees from Calais. We needed to make clear that asylum and immigration are different. Don’t let the difficult politics of immigration paralyse us from helping refugees, she said. She urged support for a new Dubs amendment which had been drafted by Stella Creasy. Andy Burnham (shadow home secretary) gave his last speech as a member of the front bench. He spoke first about the battle for justice and truth and the victory of the families of the Hillsborough affair. He hoped to see justice and truth prevail in the Orgreave case. On leaving the EU he argued for a “fair Brexit” one which protected the rights of people at work. People at the bottom should not be the ones to suffer as a result of leaving the EU. He thought many of those who voted for leave were disillusioned and felt taken for granted. Labour would need to address their concerns. This led into his appeal for “the North” which he said had been failed by Westminster. He was standing for mayor of Greater Manchester to help bring new investment into the North and to make the voice of the North heard. Jeremy Corbyn made a rousing speech which was well received in the hall. He began by tanking the Party workers and volunteers and reminded delegates of the successes of the past year, in elections and on tax credits and disability allowances in Parliament. He that while campaigning on issues matters Labour needs to win power. He saw his re-election as a sign of a demand for a new kind of politics. New movements had sprung up in other countries but in Britain the same forces had converged on Labour. He highlighted housing and the promise to build 1 million new homes, employment and the need to strengthen trade unions, and railways where nationalisation had popular support. action to secure an equal society; peace and justice at the heart of foreign policy. He gave examples of initiatives by Labour councils on energy, busses, Wi-Fi and support to start-up businesses. He praised the in-sourcing of council contracts to provide better services at lower cost. On the economy he promised to establish a National Investment Bank and to borrow to invest. The NIB would have £500 billion to invest in infrastructure. R&D spending would rise to 3% of GDP. Investment was not just physical but there was need to invest in skills. He also planned a new national education service to provide high quality education of all throughout their lives. He would offer business a new deal investment in skills in exchange for a small increase in corporate tax to fund education maintenance and student grants. Education was not just about work; all school students should have the chance to learn an instrument, visit museums and theatres. To support this there would be an arts student premium for schools to invest in cultural action. On migration he argued that pressure on services should not be blamed on migrants when the government has been failing to fund and running down services. Action was needed to stop employers recruiting overseas to undercut wages, to restore services and he promised to bring back the migrant impact fund introduced by the last Labour government. On Europe he said we should not patronise our supporters who had voted to leave and we should hear their concerns. But there would be no blank cheque for the conservatives. Labour would resist exit which was at the expense of working people. Labour would have its own agenda, such as preserving a right to intervene in industry without a need to liberalise or privatise. He ended with a warning that Mrs May could decide to call a general election next year and declared that Labour would now be put on an election footing. Brussels Labour hosted a meeting with socialist sister parties in September. Our comrades across Europe have naturally been very concerned by the Brexit referendum and its consequences for Britain, Europe and global affairs. Therefore we called a meeting, in a spirit of solidarity, to exchange views on the political situation. We were happy to welcome the Partito Democratico (IT), the Partij van de Arbeid (NL) and the Socialistische Partij Anders (BE) to the debate. BLPG Chair, Jo Wood, opened the evening saying that each member of Brussels Labour was personally affected by the referendum result. We have chosen to live and work in Brussels, have built a life here with family, friends and commitments and whatever happens we will be directly affected. However, Brussels Labour intends to carry on being active to support the closest relationship possible with Europe. In particular, we would take up the cause of Brits living and working in the EU. Emily Thornberry, Shadow Minister for Brexit, had recently visited Brussels and had invited us to provide the Labour Party with briefings and inputs during the unprecedented negotiations which lay ahead. I summarized the political situation in Britain, which had been shaken by the referendum. The new Conservative government was trying to give an impression of decisiveness but in fact everything was “in the air” pending the start of Article 50 negotiations. The country remained divided along the lines of the referendum, by nation, region and generation, in a debate that was described as “post-truth”, such was it driven by negative emotions and myths. Jeremy Corbyn, recently confirmed Labour leader, has said that the referendum should be respected but also that a Labour government would not seek to reduce immigration. Jo explained how in Scotland there was little appetite for a second referendum on independence and Scottish Labour was opposing it, so as not to destabilize the situation further. Paul Hagan showed how, in Northern Ireland, the main issue was the border with the Republic of Ireland, which could become an external border of the EU. Kier Fitch presented a number of difficult policy issues that would be thrown up by Brexit. Trade with Europe was not affected so much by tariffs but by non-tariff barriers. How would Britain retain meaningful access to the single market without regulatory alignment ? How would British researchers, scientists and students participate in their European programmes and networks ? Moreover, the ongoing court case on the invocation of Article 50 was critical because it would determine if the government would be able to bypass Parliament in negotiating the terms of Brexit. In the discussion there were diverse views. Some friends thought that, as regrettable as it was, the referendum result had to be respected and there was no point in trying to avoid exit. Others felt that it was best to move quickly to conclude the terms of the exit and then decide on an informed basis whether they were acceptable. Another view was that there seemed to be no real “soft exit” option between becoming an ordinary third country like Canada and remaining in the EU: we should not leave the EU at any cost to working people’s livelihoods and rights. Friends from sister parties asked what Labour’s approach to the negotiations would be. The need for a strategic approach was necessary, but had been forgotten during the referendum campaign. 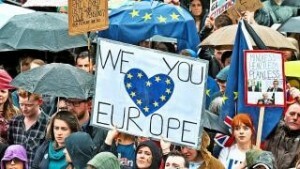 The Labour perspective on the EU as a way of managing globalization and international capital had not been articulated. However, with no overarching vision it would be difficult to have a coherent approach.